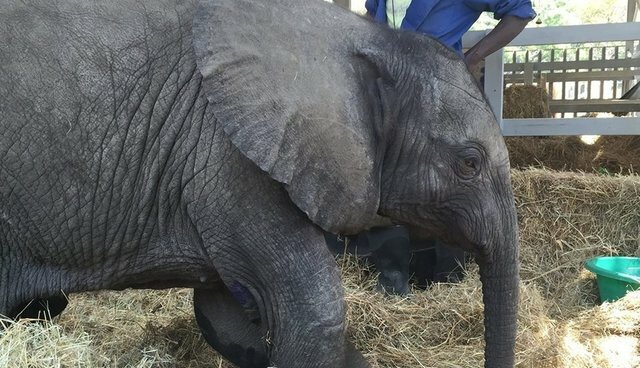 UPDATE 9/4: Despite the effort of devoted wildlife conservationists in Zimbabwe, the 15-month-old male elephant calf has died. "It is with desperate sadness that I report that little Kariba has died on the operating table," read the Facebook page of Wild Is Life, the organization that tended to the baby. "It was a gallant and courageous effort by a team of 5 highly experienced veterinarians, a specialist orthopedic surgeon, as well as the theatre team." Kariba perished Friday morning. Roxy Danckwerts, founder of Wild Is Life, wrote a heartfelt note to The Dodo about the tenderness the other orphans showed him in his short time in the nursery: "The three big elephants spent the night right up against his pen and there was a constant snaking of trunks through the bars, investigating the new arrival. The level of empathy that these animals showed was extraordinary." "He was well loved," Danckwerts wrote. "We all tried so hard." Two elephant calves are struggling for their lives in Zimbabwe. Suffering from significant emotional and physical trauma, both youngsters have just been dramatically rescued in the past 24 hours by Aware Trust, a veterinarian-run wildlife organization. 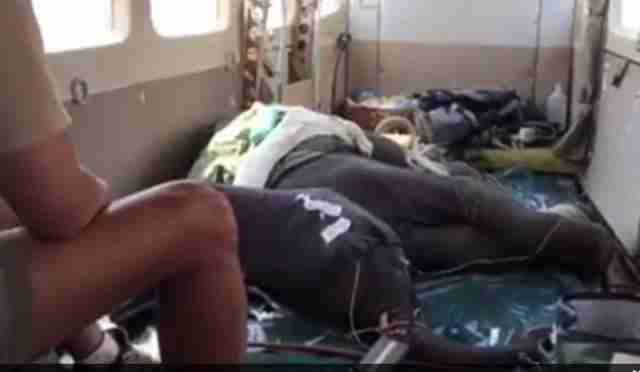 The two are a heartrending reminder of the fragility of African elephants, and the dedicated crews who are working to save them. 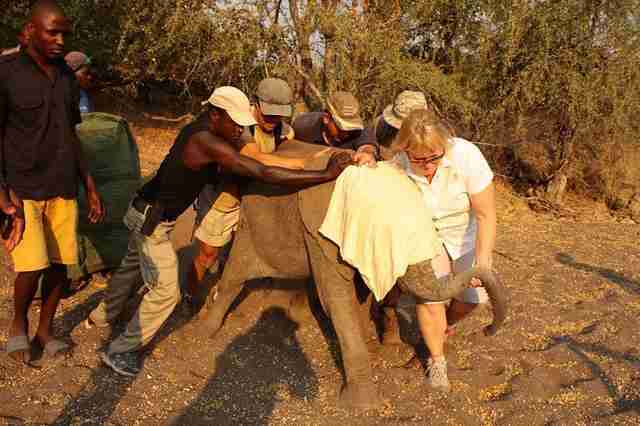 One elephant, an 18-month-old female, was discovered wandering by herself in Beitbridge, Zimbabwe. 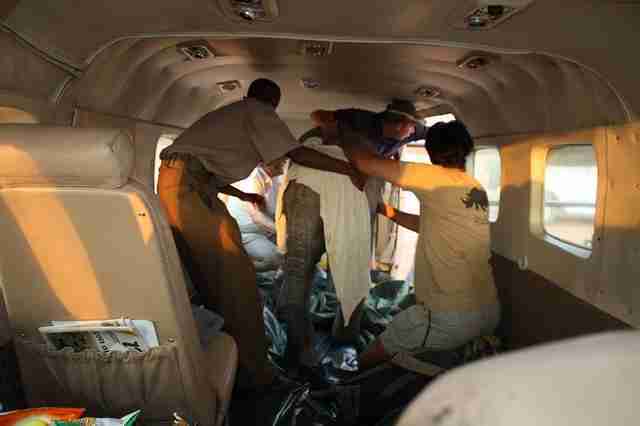 The other elephant, a 15-month-old male, was the victim of a hit-and-run car accident in an area called Kariba last weekend. 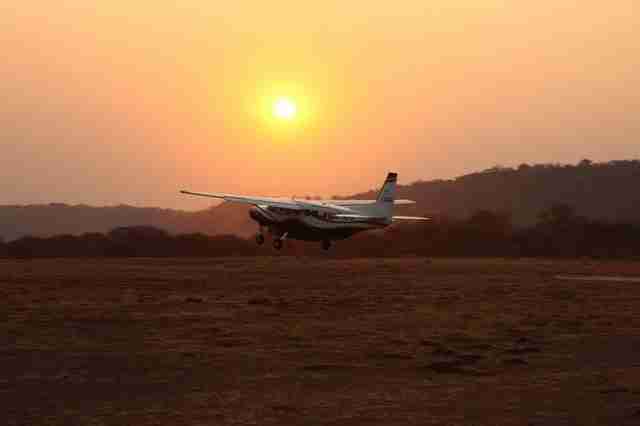 They were both flown by Aware to the Zimbabwe Elephant Nursery (ZEN), near the capital of Harare. It is unclear if they will survive. At this moment, the female elephant appears to be stable. "She is very calm," Lisa Marabini- one of the founding veterinarians of Aware- told The Dodo. 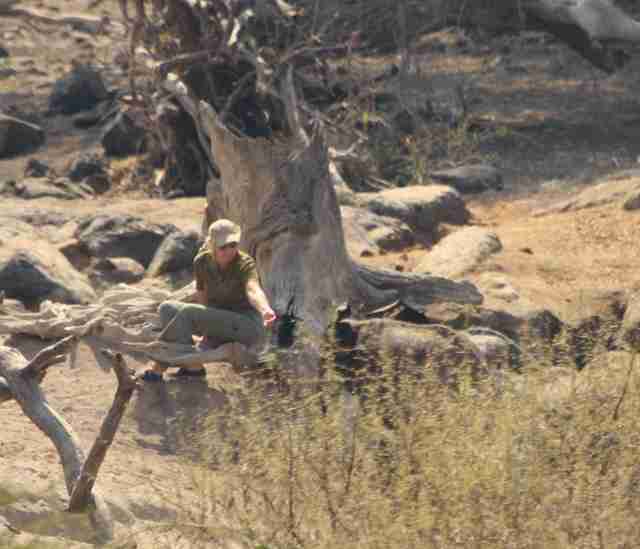 Marabini said the calf was starving due to the dryness of Beitbridge, but she's now eating well. 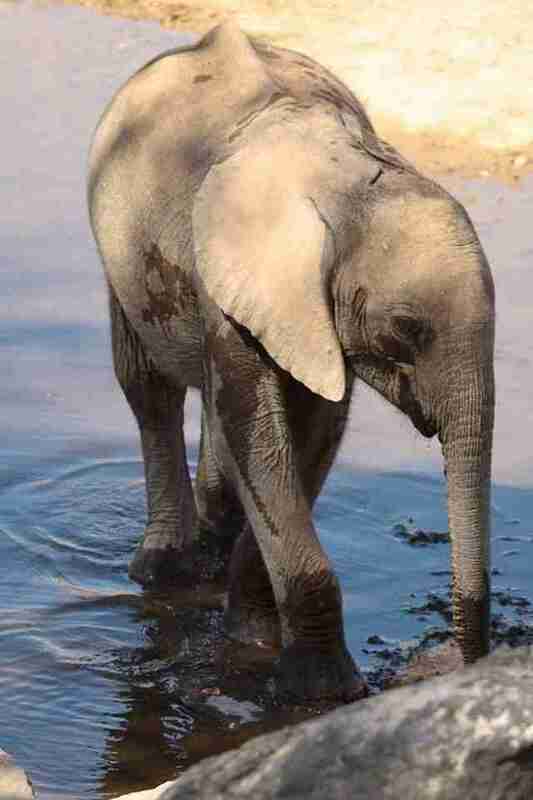 We looked up, and saw coming down to water, not far away, a young tuskless elephant calf, not four feet tall. She looked thin and a little wobbly as she headed towards us...I quickly glanced upstream behind her expecting to see the rest of the herd following. There was none. We stepped back from the edge of the stream and froze while the little elephant approached. ...After drinking for ten or fifteen minutes, the little elephant turned away and awkwardly tried to spray herself with water. She was thin, her spine quite pronounced along the top of her back. What a sorry little sight she made, all alone, her trunk acting independently of her will, refusing to do what she bade it to do! 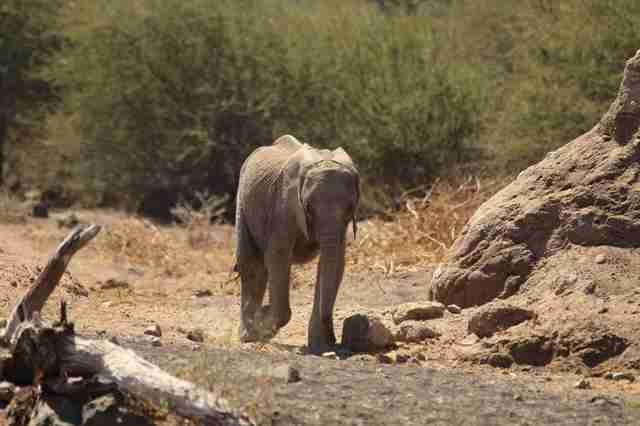 The calf continued her solitary existence for two more weeks, which is when Aware recognized the desperate nature of the situation: "This little girl ele has been alone in Beitbridge for two weeks getting thinner and thinner," wrote Aware on its Facebook page on Monday. "Any chances of her herd coming back for her have evaporated. It is estimated she is less than 2 years old. Although she will be eating some solids, ele calves are milk dependent until they're 3. Without assistance she will likely fade away or be predated on." Aware - in conjunction with ZEN and others - organized an emergency rescue. The team was deployed yesterday. 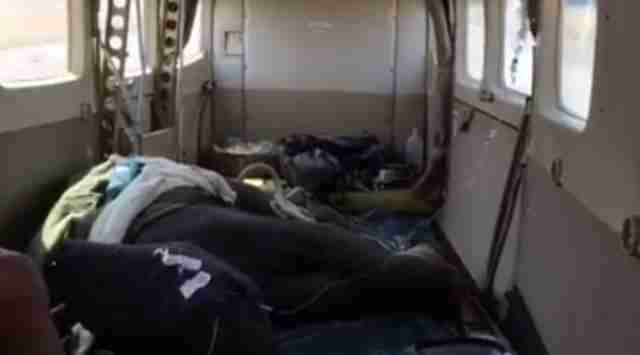 The baby was captured, sedated and immediately flown to the nursery. Unlike the female calf, the male from the region of Kariba has a "guarded" prognosis, said Marabini. "A car accident was reported on Sunday night," she told The Dodo. "He was seen struggling along on Monday with very aggressive mother and aunty who were not happy with human presence," Marabini added. 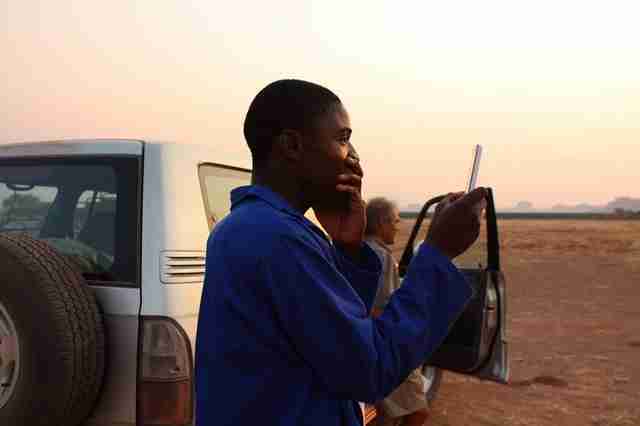 "The animal was was reported to be alone by Debbie Ottman of Kariba Animal Welfare Fund Trust (KAWFT). Debbie managed to uplift him and care for him overnight. "Aware went to retrieve the calf Wednesday morning. Sadly, the vulnerable animal has sustained a number of injuries from the car accident: "Fractured elbow. Nerve damage evident. Hard palate, inside mouth damaged (head trauma). Prognosis guarded. Looking into specialist surgery. Drank well yesterday with Debbie. Too groggy from painkillers to assess spirit today," wrote Marabini. For now, then, it is only a waiting game to see if the calves survive: "I'm praying for this baby," wrote one commentator on Aware's Facebook page. "Good luck and blessings to you all." To help save these elephants, please go directly to Aware's donation page or please go to the ZEN donation page, to help the elephants receive 24-hour care.